I felt like I needed a third eye to play Laserlife. That’s a good thing. Laserlife demands that you look at all of the stuff going on inside its searing psychedelic levels but react to only some of it. The giant flowers snatching miniature stars out of the void? Pay them no mind. The undulating space eel-thing working its way across the screen? Totally inconsequential. The neurons that you’re weaving through on some sections? Only symbolically important. But the those glowing geometric memory molecules... you definitely gotta get those. Neurons, imagery and focus are thematically important in this existentially concerned rhythm game, created by the makers of the Bit.Trip series. Laserlife starts with very little guidance. The lack of handholding is apropos, though. You’re playing as an alien intelligence trying to recreate the memories of a long-dead astronaut. The sensation of not knowing what to do is germane to the experience. But the feel-your-way-through approach also works in a more meta-aware way, too. Laserlife homes in on the collective primal instincts of its would-be audience. There, gussied up in the latest graphical advances, are the essential building blocks of video games: moving this does one thing and pressing those buttons performs another function, so use those interactions on the moving elements on screen which are begging to be acted upon. Surprisingly, after a few hours of playing Laserlife, I found I could split my attention to either side of the screen, with each eye able to keep aware of where the beat nodes were coming. It took a little more brainpower to establish some independence on the part of my thumbs—which sometimes needed to be steering the streams in different directions. Things ramp up considerably as Laserlife went on, though. The memory molecule trails go from easy-to-predict pathways gliding along one plane to criss-crossing roller-coaster waves with jagged, intense crests. One dastardly trick of perspective has them starting off on one side of the screen and then crossing over to the other. Laserlife’s structure features three stages of life, each with four memory levels to zoom through. Each level gets portioned into three parts: collection, harmonization and then the warp phase. The first part has memory molecules zooming into the foreground and the player need to collect (and/or hold) as many of them as they can to proceed. After that comes a segment where your streams need to knock down memory blocks. Lastly, you need to guide the streams past obstacles so they can ignite a memory in the skeletal astronaut’s cranium. At the end of all that, you get a memory. Large parts of Laserlife feels like Rock Band or Guitar Hero without the tidy Euclidean rigidity, and reminiscent of other sinuous beat-matching games like Groove Coaster, too. There’s also a clear homage to the Dreamcast/PS2 classic REZ. While there’s a basic foundational similarity—weighty themes with trippy, wide-lens psychedelic panoramas— it’s different enough from that game to feel like an interesting descendant. 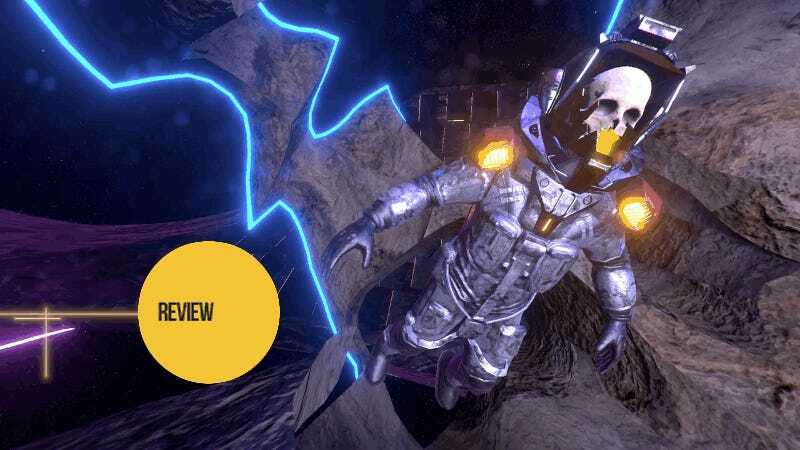 Laserlife doesn’t quite deliver on its ambitions, in that you don’t necessarily feel like you know all about the nameless astronaut’s life once the game’s all done. What the player gets are high points from an existence that ended long ago. But, playing Laserlife did make me think about bizarre nature of remembrance, of the way that weird snatches of life either flash through your brain or remain lodged there with disturbing vividness. The physical interaction with Laserlife’s gameplay made me feel buzzed. I had to think about moving thumbs simultaneously yet independently of each other, while also keeping my pattern recognition skills active enough to react to changes in the game’s flow. I couldn’t soullessly auto-pilot my way through it the way I could with many a third-person action game or FPS. This game is a good drug. It makes your fingers feel like they’re dancing and makes your brain feel like it’s sparking off with weird new energies. Laserlife is short enough to be zipped through in one sitting but it’s not forgettable.